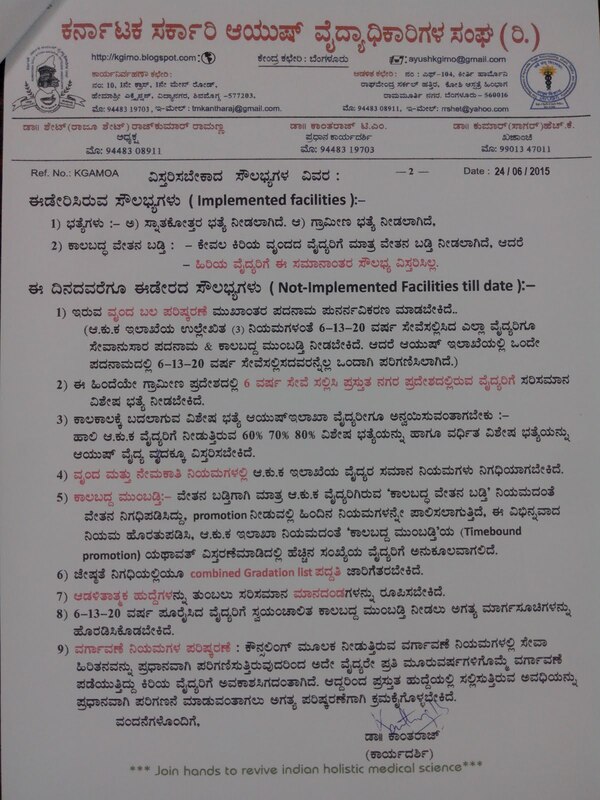 Special EC Meeting @ Blore with Director & DD was successful …..
For the first time we the KGAMOA state & Dist. Executives discussed the things which are essential to get PARITY as per Cabinet Approval on 10/01/2013, with Director along with DD CAO AO GA in conducive environment …. The Director & other chief officers of the directorate discussed many things …. In which they asked KGAMOA Association legal aspects & enquired, How association is driving their members attitude towards executing their duties & responsibilities in a constructive way. We presented our opinion in a power point which are prime & essential official process to implement COMPLETE PARITY …. We informed all the aspects which we discussed earler with HM (Subjects as listed below )which are not extended to ayush drs & not going equally with HFW …. ← PG MOs details just for ur ref… & verification …..